KARACHI: The Indus Motor Company (IMC) has announced that the company?s new locally assembled Fortuner will be launched on March 8, 2013 in Pakistan. The new sport utility vehicle (SUV) price would be around Rs 5.2 million, this was revealed in Toyota?s briefing with analysts. 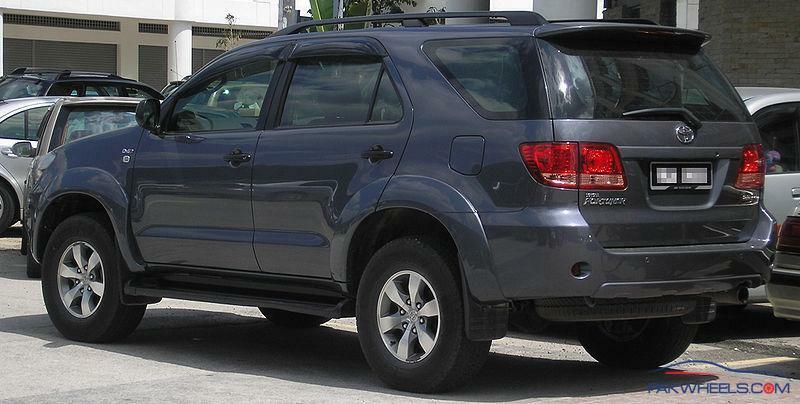 Although imported Fortuner is already available in Pakistan as IMC started importing the Fortuner in 2009 but for the first time Toyota assembled it locally and it would be available in the first week of March 2013, according to an analyst. The locally-assembled SUV will be 37 percent cheaper than the imported Fortuner as the local one costs Rs 5.2 million while the imported one is for Rs 8.2 million. The specifications of new Pakistani Fortuner 2013 are 2.7 Vvtipower seats, leather seats, alloy rims, DVD, NAV, BVC, wooden panels, fog lamps and multimedia steering. IMC has started booking for the new SUV. It is pertinent to mention here that Toyota has already launched a five-speed automatic version of the Fortuner SUV in India for around 2.2 million rupees this January. In Thailand where it is most popular, the Fortuner SUV is offered with two diesel engines, a 3.0-liter unit producing 163HP and a 2.5-litre delivering 144-horses, and a 2.7-litre gasoline unit rated at 160-horsepower. Moreover, IMC anticipated sales of 2,000 units of Fortuner in the year, management has planned capital expenditure of Rs 6 billion in fiscal year 2013-14 with the yearly ratio of 30-70 percent, respectively. The planned capital expenditure is mainly on account of Toyota Corolla?s new model launch, said an analyst. IMC will not expand their production capacity in near future as company is meeting demand and supply of Corolla car in manufactured in Pakistan, current capacity remains 100 percent, analyst further said. Management of IMC told analysts that automakers in Pakistan are willing to have two way trades with India and in this regard government of Pakistan and automakers of Pakistan jointly have put into words to government of Japan to enforce the two way trade with India. IMC management continued to pose influx of imported car as a threat. In this regard, as of December 2012, approximately 80,000 units of cars were imported in first half of fiscal year 2012-13.Given that, and along with the current inventory situation of used cars (approximately 20,000-25,000), the magnified impact of the Economic Coordination Committee?s (ECC) decision of reduction in the age limit to three years would be evident in FY14, IMC told the analysts. The IMC?s other income declined significantly by 48 percent on yearly basis. This decline was mainly due to lower interest income on cash deposits, along with the lower advances from customers due to depressed sales by the company during first half of FY13, the analyst added. Dear Indus Toyota do you ever think of the Middle Class ??? The pictures you posted also not the latest. You need to some research man. """The planned capital expenditure is mainly on account of Toyota Corolla?s new model launch, said an analyst.""" That means there may be a launch of new Corolla in 2014?